Raleigh, NC — The legendary jam band Phish is followed by police just as often as they are followed by their fans. Over the years, police have surely made millions of dollars arresting nonviolent Phish fans who were just trying to have a good time. The band’s shows always seem to attract police because their fans are known to create a wild and free, but mostly safe, party atmosphere. This week in North Carolina, the police came in full force at a Phish concert at Walnut Creek Amphitheater, arresting over 60 people in a “special enforcement operation” assisted by the area’s alcohol control bureaucracy. The charges ranged from drug possession to distribution, and sharing alcohol with a minor. Fans in the parking lot who were caught drinking were charged with having open containers, and other alcohol violations. In total 115 charges were given to 65 people, many of whom traveled to the event from out of state. Not one of the charges were for a violent crime or a crime against property. Every single one of the charges was related to drugs, alcohol, or doing business without permits. Local newspapers publicly shamed the victims by publishing their names, charges, and mugshots. 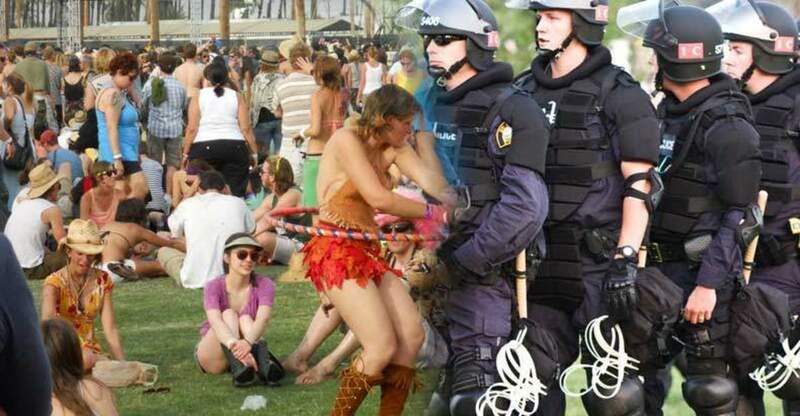 The Free Thought Project has put together a survival guide on how to interact with police and safely attend concerts, music festivals, and sporting events. You can see it here.